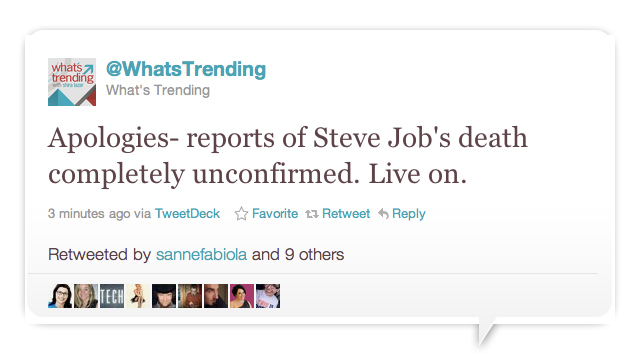 Just in case anyone is still concerned, Steve Jobs has not died! Early today, it was single tweet that set the internet a buzz and AAPL stock to drop. Here a link to some of that twitter buzz. As we continue this exercise of writetrack.com, I am going to take this opportunity to RANT about the irresponsbility that we see over and over again with this New Media. This has happended a number of times over the last few years and it’s only a matter of time before some real damage is done by these accidents or even worse, intentional false headlines. FFS – If you can’t confirm it then don’t repeat it, retweet it, post it or even whisper it. Incredible contribution,I believe you have undeniably launched a web page I would like to read frequently. Thanks.